There is a growing interest for vegetables and fruit from the past. Compared to, say the seventeenth century, the variety in apples, pears and plumbs has become less and less. Nowadays it is mainly those varieties that are easy to grow, have a high produce, and are resistant to diseases (and the used pesticides) that you can buy at the average greengrocer or supermarket. Luckily there are still idealists who are trying to conserve ancient varieties. Quinces are -at least in the Netherlands- an almost forgotten fruit. They can still be bought, but you’ll have to look for them. What are quinces? They belong to the same family as apples and pears, the Rosaceae. 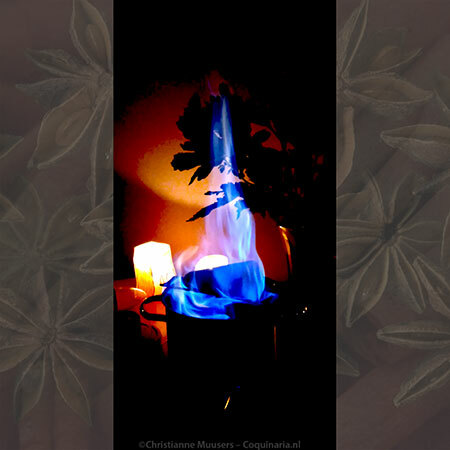 The scientific name of the quince is Cydonia oblonga. The fragrant fruit, covered with green-grey down, originates from the Caucasus. It was already greatly appreciated by the ancient Greeks. The quince was dedicated to Aphrodite, and it is presumed that the famous golden apple given to Aphrodite by Paris was in fact a quince. 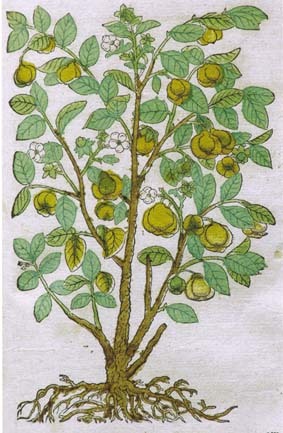 Because of their fragrance quinces were used in perfumes and ‘air fresheners’. Raw quinces can not be eaten. They are very, very firm, and also very sour. Quinces are often cooked, but you can also roast them in the oven, like apples. 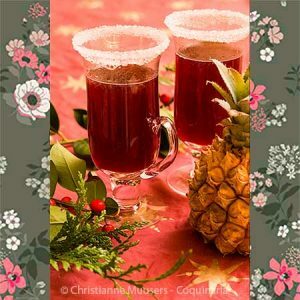 Because the fruit contains a lot of pectine they are very suitable to be used in jellies. Harvesttime is October/November, but you can keep quinces for a long time. There are many several recipes for quinces in medieval cookbooks, and sometimes it isn’t clear whether a recipe is for apples or quinces. 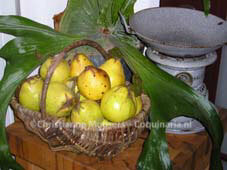 Quinces were often used in the same manner as apples or pears, in pies or to make purée. They were cooked and conserved. They are so rich in pectine, that ground pips of quinces are used as coagulant in a red wine jelly. The manuscript that the recipe for the cake was taken from (ms UB Gent 476), has more recipes for quinces, such as a pasty where the quinces are put in whole (recipe nr 42 and 171), they are made into a purée (recipe nr 112 and 116), and they are being stewed (recipe nr 195 and 222). The extended version of recipe 195 for stewed quinces stuffed with marow and raisins can be found here. In ms UB Gent 476 you can find two ways to conserve quinces for a whole year. For most of us these methods will not be applicable, because you need some things that will not be found today in the average household. When you have had a good quince year and despair what to do with them, start with conserving: You need a small cask. Cover the bottom with a layer of wine lees, lay down quinces in one layer, add more winelees, more quinces et cetera. Cover the cask with a lid, and keep in on a shelf. Another method which can also be used to conserve grapes: Sieve the ashes from the hearth (or BBQ), place the quinces in such a way that they do not touch each other, and cover them with the ashes. (edition p.104). The original recipe, taken from ms UB Gent 476 (Edition p.107, recipe nr 120). The text is taken from the manuscript, the interpunction is from me. Om een sonderlijnge taerte te maken. Neempt quee appelen gesoden in schoon watere ofte peeren gebraden vj of vij, amandelen gepelt een vierendeel pont, versche wrongel een vierendeel pont, een hantvol rosijnen sonder steenen. Stootet tsamen wel cleyne ende soetet met suycker ende caneele ende ander cruyt tot uwer belieften, vj of vij doren van eyeren ende een vierendeel pont versche botere. To make a special cake. Take quinces, boiled in clean water, or pears roasted 6 or 7, a quearterpound peeled almonds, a quarterpound fresh curd, a handful of raisings without pips. Grind it well together and sweeten it with sugar and cinnamon and other spices to taste, 6 or 7 egg yolks and a quarterpound fresh butter. Item wanneer dat ghij dese taerten maken wilt voor crancken menschen. zo neempt inde stede vanden wrongel dat vleysch van een pertrijsse ofte kieken dat gesoden is, laetet cleyn stooten. When you want to make this cake for sick people. Then take instead of curd the boiled flesh of a partridge or chicken, and let it grind well. When baking a pie it is supposed to have a crust. The recipe remains silent on this. That is not unusual in ancient cookbooks: everyone knew the stuffing was meant to be baked in a crust, and everyone knew how to make dough. It was considered superfluous to mention this, which is why there are so few contemporary dough recipes. By the way, often the crust of pasties and such were not meant to be eaten at all. They were used like serving dishes, and sometimes even re-used. 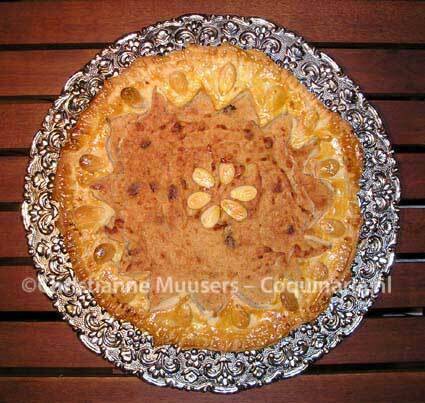 On this page you find several recipes for dough for savoury pasties. You can of course also use a recipe of your own. Just do me a favour and don’t use frozen supermarket-dough. Gebak voor bij de thee of als dessert, 6 grote tot 12 kleine taartpunten; voorbereiding 40 minuten; bereiding 60 minuten. Boil the peeled, cored and quartered quinces until soft (see the recipe for jelly below). meanwhile prepare the dough. Use a simple dough for pasties, with the addition of three tablespoons sugar. According to the original recipe all ingrediënts for the stuffing must now be ground in a mortar, but I prefer to add the raisins later and keep them whole. So: Add everything except the raisins to a mortar or blender, and turn it into a purée. The amounts given are sufficient for two large flat pies, or two spring forms with a diameter of 22 cm. It is easy to make half the amount. However, if you want to make the quince jelly, you might want to make the full amount. Carefully grease a low cake mould or a springform, and sprinkle some flour on the inside. Roll out the dough, drape it into the form. scoop the stuffing into the dough-clad form, and decorate the cake or pie to your fancy. Bake the cake in the oven (at 180 °C or 350°F) for 40 to 50 minutes. Check whether the stuffing is done, remove the cake from the oven. Let the cake rest for five minutes, then take it out of the mould. Let the cake cool on a cake-rack. What would be the ideal moment to serve a special cake as this? At tea-time of course, maybe as a special birthday treat, or as a (rich) dessert to finish a meal. Not necessarily with whipped cream. That was still very special in those days and was served as a separate dish. If you decided to make the quince jelly too, you could compose a grand dessert, with (warm) pie, a spoonful of jelly, and cream, whipped with a few drops of rose water (no sugar). The recipe for the quince jelly is two hundred years younger than the cake recipe, but there are also contemporary recipes to be found. I just fancied this one. Very fresh cheese. Rennet is added to fresh milk, the coagulated milk is strained in a bag, the result is quark. The Germans also call it quark, the Dutch kwark. According to Wikipedia ‘quark’is originally from the Slavic Twarog. The French just call it Fromage frais (fresh cheese). Manuscript UB Gent 476: Ria Jansen-Sieben and Johanna Maria van Winter, De keuken van de late Middeleeuwen (The kitchen of the Late Middle Ages, Bert Bakker, Amsterdam, 1998, 2nd revised edition; first published 1989).